Do you have days like those? I was so productive on Saturday and got a couple quilt backs sewn up, and some quilt sandwiches made. We had a rainy and gray weekend, so I thought I’d see if I could get a couple quilted, and maybe even one completely finished by the end of the weekend. No such luck. I started in on the scrappy borders quilt (temporary name only – I don’t like the sound of that one!) and thought that maybe instead of stippling, I’d go for concentric squares inside each block. It started out well enough, but after doing a few of them, I realized that the adhesive wasn’t doing its job and the center of the quilt was going to end up with a lot of puckers if I kept going. Unfortunately, I like this quilt a lot, and I couldn’t bear to see it ruined, so out came the seam ripper. And as you all know, what takes only half an hour to sew, takes about 3 hours to rip out! And to top it off, I managed to snag the top of the quilt and make a little hole. I’m not letting it get the best of me though. I got it all ripped out and patched up, remade the quilt sandwich, and got it quilted by the end of the night. And it looks good. If I hadn’t told you, I don’t think anyone would realize how trying this was! Oh, and little peek at the back. 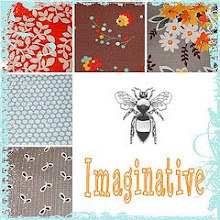 I’ve had the book Material Obsession for a while now and ever since I saw the photo on the cover I knew that I wanted a quilt with a lot of this green Flea Market Fancy on the back. 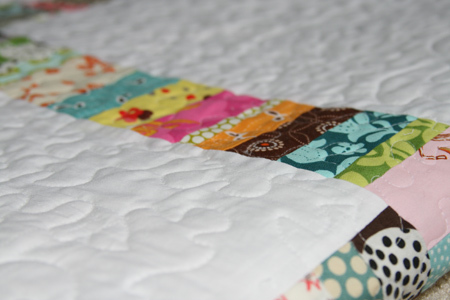 This scrap quilt seemed like a perfect choice! This entry was posted in Household Sewing - bags, napkins, pillows, Posts about Quilts and tagged flea market fancy, free motion, quilt, quilting, scraps. Bookmark the permalink. Pretty pretty pretty! And boy is that tearing out sewing frustrating… glad that it all worked out for you! That is precisely why I get so terrified before I quilt a quilt. Great save, though! it looks great!! i’m so glad you were able to save it, that would have been so sad if it would have gotten ruined. and, i love the back!! Your quilt turned out lovely though. I foiled the side of my skirt last night after a successful weekend of two pants and spent a good 40 minutes ripping it and re-ironing. I’ve sat and sat with my ripper. . . glad you’ve gotten it finished up the way you like it! I’ve never used the spray adhesive — do you like it? Amy – I do like the spray adhesive… I’m partial to the 505 brand. glad you had a productive sunday…sorry about the session with the snarky seam ripper, but it sure looks like it was worth it…i’ve had lots of those days. You must be so patient. I would probably put the quilt away for at least a week to be able to get it all fixed. Already loving the back. What a frustration. It does take so much longer to seam rip than it ever does to sew. It’s so unfair. By the way the quilt is beautiful. Oh, i feel your pain! I don’t know what’s worse, ripping out all the seams, or picking out all the teeny tiny pieces of broken thread! Hate that! It looks wonderful! I know that sick feeling when you realize the only choice is to take it apart and start again. It was well worth it though…now when you look at it you won’t have second thoughts. Sorry about the frustration, (maybe seems small compared to today’s!??). Anyway, it looks beautiful. You take the best pictures! 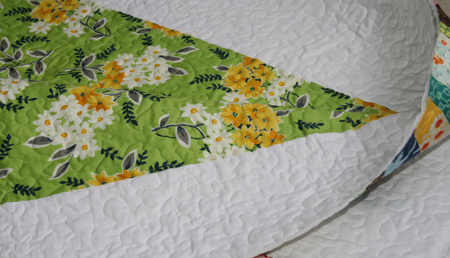 Wow, your quilts are sew inspiring! You must be super speedy! I wish I had that sort of time. I feel your frustration with seam ripping. In fact, I sewed something the wrong way this weekend and then couldn’t even find my seam ripper! I must check your blog more often because I am sad I missed the give away. Bummer. Keep it up though! I love to see your quilts! ahhh, we all know our own flaws within our own quilts but no one else will ever notice & the best part is that the quilt is gorgeous!! also, you mentioned that you use spray adhesive…but I was wondering what kind of batting you use? Love the back. I think I might need that book. 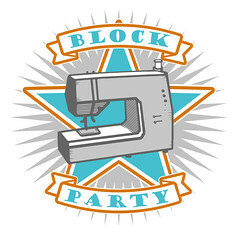 How about BlockParty for the name? Girl, the seam ripper and I were hanging out a ton on Sunday too. I’m so glad to see that I’m not crazy. When the day was over, I was almost ready to rock myself in the corner! So glad you pulled through! Looks so good! I hit a recent quilt with the seam ripper, too. The quilting lines just pissed me off. THey’re better now, but man. It takes so much time. Fortunately, the result is sooooo good. Guess it’s like giving birth. By the time it’s done and so pretty and cute, you don’t mind all the work! Love it your so creative…. Thx…. for BLOGGING…..